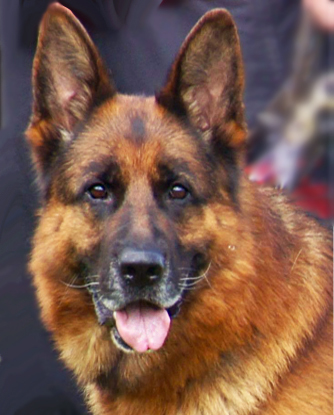 Lets take an opportunity to pay our wholehearted tribute to Horand - Horand von Grafrath (formerly Hektor Linksrhein), "The Foundation Dog" of the GSD breed. 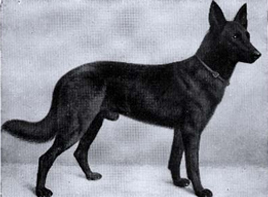 An important phase in the evolution of the German Shepherd Dog breed starts from Horand (DOB January 1st, 1895), SZ1. 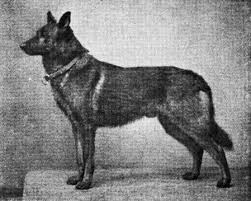 There’s no better way we can pay our tribute to Horand von Grafrath than by mentioning here what Captain von Stephanitz, the originator of the breed said about this awesome dog. "Horand embodied for the enthusiasts of that time the fulfillment of their fondest dreams. He was big for that period, between 24" and 24 1/2", even for the present day a good medium size, with powerful frame, beautiful lines, and a nobly formed head. Clean and sinewy in build, the entire dog was one live wire. His character was on a par with his exterior qualities; marvelous in his obedient fidelity to his master, and above all else, the straightforward nature of a gentleman with a boundless zest for living. Although untrained in puppy hood, nevertheless obedient to the slightest nod when at this master's side; but when left to himself, the maddest rascal, the wildest ruffian and incorrigible provoker of strife. Never idle, always on the go; well disposed to harmless people, but no cringer, mad about children and always in love. What could not have been the accomplishments of such a dog if we, at that time, had only had military or police service training? His faults were the failings of his upbringing, never of his stock. He suffered from a superfluity of unemployed energy, for he was in Heaven when someone was occupied with him and was then the most tractable of dog." So by Sir Max's words we can at ease understand what are the desirable qualities that a well bred German Shepherd should actually have. Horand von Grafrath was a name that had been given to the dog by Captain Stephanitz. There is an interesting history behind the Horand’s life story. 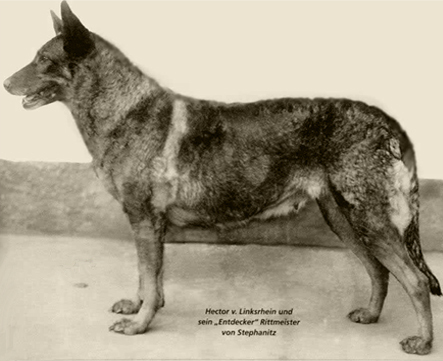 While attending a dog show in 1899 the captain came across a Thuringian type sheep dog of medium stature, whose name was Hecktor Linkshrein. It was Hecktor's typical shepherding qualities, his nature and anatomical structure that grabed captain's attention, and he fell in love with him at the first sight. He purchased him at the spot and later he changed his name to Horand Von Grafrath registered him with his new name the vereins newly found stud book. 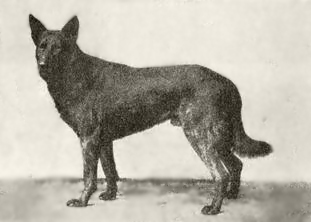 Horand was the first shepherd dog to find the first place in the new stud book of the verein. 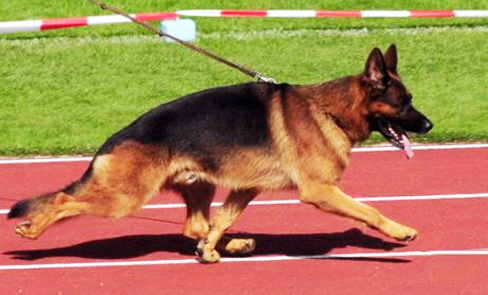 “Verein” here is Verein für deutsche Schäferhunde (shortly known as SV – the “Club For German Shepherd Dogs”). Heinz von Starkenburg - SchH3, Kkl 1, born from the combination of Hektor von Schwaben X Lucie von Starkenburg - SZ 131 (born - 1896). 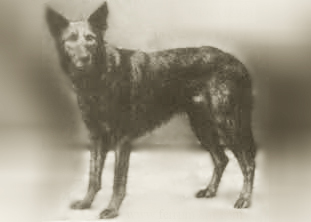 Heinz achieved some lasting fame through his progeny - the 1906-7 Sieger Roland v Starkenburg - SCHH3, Kkl 1 (born 1903), the first really outstanding dog of the breed. Humphrey (1926) believed Roland owed little to Heinz and more to Hektor v Schwaben. 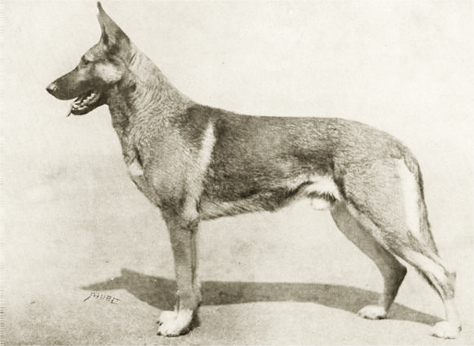 These three studs - Heinz, Beowulf and Pilot had been used in the breeding program later, and thus their progeny contributed immensely to the development of German shepherd Dog breed. Captain Stephanitz heavily inbred on his very favorite Horand as well as his brother Luchs with an aim to strengthen the bloodline. Horand's most celebrated son, Hektor von Schwaben, the second German Sieger, was mated with his half-sister as well as through daughters of his own sons, Beowulf, Heinz, and Pilot III. Heavy inbreeding was the base of the development of the breed. But eventually is concentrated undesirable recessive originating from the mixing of the original strains. Von Stephanitz hence decided introduce unrelated blood of herding origin through Audifax von Grafrath and Adalo von Grafrath into his program. When it comes to keeping your GSD happy and healthy, food obviously tops the list of concerned. Then exercise. 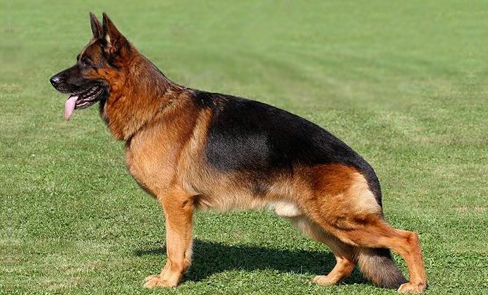 Yes… I have always tried to strike a balance between the food and exercises for my shepherds. I have rarely purchased commercial dog foods for them, but have been able to keep my shepherds as healthy as a few others. In my previous post: Diet Management For German Shepherd Puppies I have talked in depth about what your puppy’s food should contain. 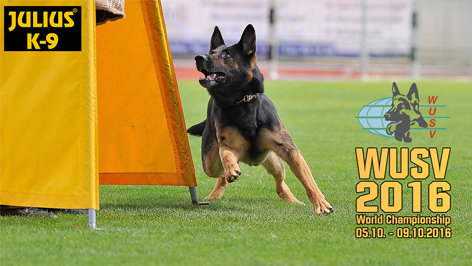 Keeping your GSD in perfect health is no strange formula, but a passion to see them moving around healthy. Its not just about feeding them good quality food in huge volume but, feeding them right kind of food in right proportion with the calorie they loose. It is a myth that German Shepherds must be given meat everyday. Remember that dogs are not lions… they are not carnivorous animals. They are omnivorous creatures just like you and me. The major difference is that our dogs are less capable to digest complex food. Therefore it is recommended providing your German Shepherds with food that they can easily digest. You may be wondering, if wolves are ancestors of today's canines, and if wolves in the wild live mostly on meat, then why not giving Rex a diet filled with meat? Do they really need greens added to their diet at all? Well there are two schools of thoughts. (i) the first group for instance, AKC and experts at Hills believe the fruits and veggies should be included in your dogs food - either as treat or in the main diet. Wolves in the wild attack chiefly herbivorous animals, and they consume the stomach contents and the intestines of those animals that mainly contain vegetable matter. (ii) There is one second group, like RawFed that considers dog as purely carnivores. According to these people, based on the dogs' dental configuration, physiology and internal and external anatomy they are not omnivores. However, with all supportive documentations and research works, The National Research Council of the National Academies and some larger dog food companies consider dogs as omnivores. Therefore, when it comes to food for your German Shepherd, it has to be a right mix of meet, fruits and veggies. However, not all food that are good for humans are good for your shepherds. Here's a read on some of the human foods that should be added to your shepherd's diet. If you are more into home made food for your GSD that’s quiet appreciable, but the food should be well balanced, nutritious and can provide them with adequate amount of energy. Failing to provide your GSD with meat for a couple of days should not be a matter of concern. Meat is one of the essential components, but not the only essential component of his food. His food must contain some green, ground up fruits, eggs, yogurt and cottage cheese. Lentil, apple gourd or ridge gourd, pumpkin, sweet potatoes, a few pieces of sweet potatoes, turmeric, and a few drops of vegetable oil, chicken/turkey and rice can be mixed together and boiled together for a few minutes until they are properly cooked. Lentil: Although some of the legumes can be harmful to dogs, but thankfully lentil does not fall under this category. Homemade lentil soup is a great addition to your GSD's diet. It helps alkalize your shepherd's body by balancing its pH level, manage blood sugar level, manage cholesterol level, maintains heart health, maintains digestive health by promoting growth of healthy microflora, helps you maintain your dog's weight, provides energy and improves immunity by preventing deficiencies in critical minerals like iron, folate, zinc and manganese. Ridge gourd (also known as Sponge Gourd): Lentil is rich in dietary fiber and enriched with all the vital elements that include Vit-C, Zinc, Iron, Riboflavin, Magnesium, Thiamin and traces of another minerals. It is low in saturated fat, cholesterol and calories that aids in weight loss. Pumpkin: The potassium and vitamin C content in pumpkin support your dog's heart health. Pumpkin is a rich source beta-carotene, which is a powerful antioxidant. Pumpkin is high in dietary fiber which helps bowel regulations - whether the dog has diarrhea or constipation. Asparagus: Properly boiled into soft stalks, the asparagus, as is packed with vitamins and minerals, can be a good addition to your dog's diet a few days a week. It is rich in vitamin K, folate, copper, selenium, vitamin A, vitamin B1, vitamin B2, vitamin B3, vitamin B6, vitamin C, and vitamin E. It is also a good source of manganese, phosphorus, potassium, choline, zinc, iron, protein, and pantothenic acid. NOTE: Asparagus fern (plant part) is toxic for dogs. Brussel sprouts: Brussel sprouts are good for your German Shepherds as long as they are fed in moderate amounts. sprouts are rich in vitamin A, Vitamin B1, Vitamin B6 and vitamin C. It is also rich in antioxidants that helps reduce inflammation and improve blood circulation. Please note that too much of sprouts in your dog's diet is not recommended. Sprouts contain a high level of isothiocyanate, a substance that improves the ability of the intestinal muscle's to push food and waste through the gastrointestinal tract. This builds up excess bacterium, which forms gas. Spinach: spinach is an immune system booster, restoring energy and vitality. Spinach in your dogs diet in moderate amount once or twice a week may be a great idea. It prevents cancer and is good for the his heart. Spinach is a natural source of vitamin A, vitamin B, vitamin C and vitamin K. It is also a great source of natural calcium, iron, potassium, fiber, manganese and folate. It is not recommended to shift from your food to this recipe all at once. But once they are habituated with this kind of foods you can offer them this occasionally. 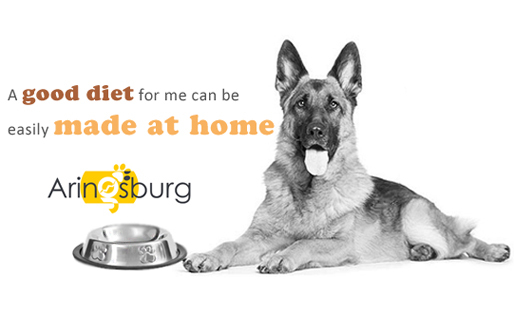 A good diet for your German Shepherd can be easily made at home. You can keep your dog healthy, fit and active with easy to make homemade recipe. All you need to do is to make a routine of what to give today. Not all veggies should be given everyday. Choose as per your will and as per the guide above. Just make sure what you want to put in Rex's feed bowl. Chop the veggies properly, put in fresh meat (chicken/turkey/beef/lamb), put in rice and lentil, add a pinch of turmeric, boil them properly together until they are well cooked. Bring it to room temperature and feed Rex fresh.